India Company before returning to Glasgow. He was interred here in 1842 and his brother, James Monteath Douglas, was interred here in 1850. The mausoleum was designed by architect David Cousin, who is best known for his Edinburgh work. 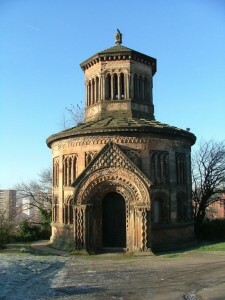 It is an unusual building, being of neo-Norman design in this cemetery of predominantly classical monuments. Intriguingly it has no writing, lettering or numerals inscribed anywhere on it – it is completely silent about its occupants. It is a circular temple building 30 ft in diameter, the design of which was based on the Knights Templar Church of the Holy Sepulchre 8. The main lower portion of the building is split into sixteen facets around its circumference with one double-bay-wide entrance arch and fourteen deep, round-arched blank window niches at low level, each one elaborately carved in a different design. Above these are recessed panels with four columns topped by semi-circular interweaved arches. Above this a cornice supports the edge of the lower roof – a shallow conical roof of large stone slabs, each slab alternately higher and lower around the roof. Over this sits a lantern with eight facets, each facet having three slit openings flanked by columns topped with arches. Above these are regularly spaced grotesque faces which support the cornice and roof of the lantern – again stone but in a common tile pattern. 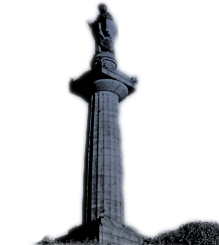 This is topped with a mini version of the Choragic Monument of Lysicrates. 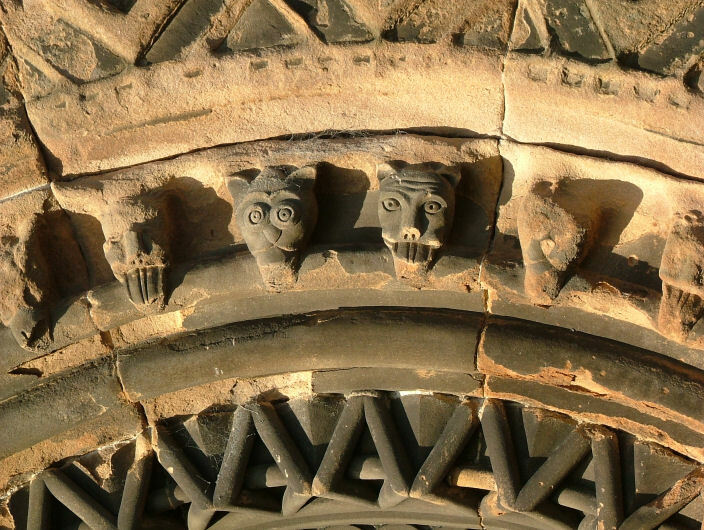 The entrance porch is elaborately carved with a round arch over the door including carved grotesque faces and a pitched stone roof above. The door is solid timber, secured with two padlocks. I was unable to gain access to the interior of the mausoleum as the Council have lost the keys, however Ruth Johnston notes in her book “Afterlives Tales Of Interments” that “internally the monument is unfinished rubble work walls and the roof of the tower inside is brick.” This based on the description in George Blair’s ‘Sketches of Glasgow Necropolis’. A building in Edinburgh on Rutland Place by David Cousin sports an identical entrance porch – every detail is the same! Nearly every surface of this building is decorated with carving, much of it high relief and intricate. Please visit our Monteath Appeal page.